BATTERY-POWERED MODEL AVAILABLE, CALL FOR INFORMATION. Ideal for feeding conveyors, printing, or punch presses, this economical lifter raises heavy pallets. Solid steel bar scissors. 180° steering arc. 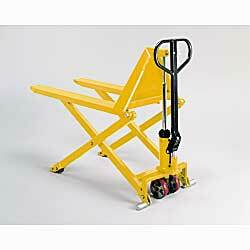 Features include: inside loop handle mechanism and mold-on polyurethane wheels and load rollers. Does not work with closed pallet unless pallet is set on top of forks. IN STOCK. XR-1408A 242	 21 x 44-1/2"	 21"	 2,200	 3.631.5"
XR-1408B 275	 27 x 44-1/2"	 27"	 2,200	 3.631.5"